I know it is January; diets, cutting back etc..
but I wanted to start looking at the icing on the cake - literally! I was icing a cake yesterday in a rush and decided to just pile on the butter cream into some 'Mr Whippy -eque' peaks of loveliness. I decorated these with white chocolate stars and was amazed that sometimes you don't need to be perfect and proud of your delicate iced creations. My Mum also told me a story how on Friday in the supermarket a lady about my age stopped her and asked 'how do you make butter cream?' She then asked if it is 'butter and cream' which she had in her basket. She was decorating her son's birthday cake. My Mum told her as she taught me, butter cream is butter whipped with icing sugar until the icing is white and forms soft peaks. The lady was so grateful to my Mother and my Mother was equally happy that her daughter was taught to goodness of icing! Thanks Mum for the lessons. So as I was forming peaks of icing, I thought how I had iced in past using basic and easy icings. The Humming Bird bakery has a lot to answer for as when baby was little, it was so easy to get a palette knife and smooth the icing over a sponge cake and decorate. The washing up was minimal and no bags or pipers to wash! I still use this technique of a little curl on top of my cakes and decorate with stars or cherries. To make the butter cream smoother I add glycerine and an essence which was it smooth and fluid and the extra liquid in the essence makes the spreading of the cream easier. Sometimes you cannot find the card with the message on it, you might want to say something personal or simple and cut to the chase..'I love you' or 'you are great, you deserve the promotion! 'I wanted to congratulate a friend on the great news that baby number two was on the way. The thing is that you don't get cards with that on.. So, I got out my paints and painted what I wanted to say on two pieces of paper I stitched together on my sewing machine. When I had painted my words, I highlighted these with gold paint and soft "B grade pencil. I took a colour that I loved and would stand out easily such as red. To get you started use a colour such as blue, green or red as it will look good on cream paper. Yellows and pastels will not have the same impact due to the colours being softer. My friend texted me today to say that she loved it. Why not have a go and let me know how you got on? My new craft for 2013, crochet! In 10 minutes I made this cute brooch..
People always said that crochet was easy and as a knitter, I thought I would get it whirl and boy it i easy. I would describe crochet as half way between knitting and lace making. You only have a hook not two and make your stitches by looping and passing through your hook. It seems to grow faster than knitting and is more 3D in my opinion. I am no expert but this little crochet brooch took me ten minutes to use using three easy stitches, chain, slip and half treble . My knowledge of patterns is very basic but this is only week one. Purple Linda 's online store has a wealth of good quality yarns. Just be careful the UK and US terms are slightly different here is a quick guide. For A Lower Fat And Very Rich Bol..Try The Veggie Option! I love, love, love spag bol and being vegetarian doesn't stop me cooking this for the family. Plus as it is so rich and low fat you can treat yourself to a glass of red with it? Serve with your favourite pasta cooked al dente! 1.If you are using TSP, add this to boiling water and heat for 5 minutes so that it is soft and fluffy. If using Quorn mince you don't need to do this. 2. Saute the red onion and mushrooms in a pan with the herbs. 3. Add the drained beans and TSP or mince and brown. 4. Add the passata, sugar and stock cube. Bring to the boil then quickly reduce and simmer for 20 minutes. 5. Add the balsamic vinegar just before serving. Grate a few shavings of hard cheese over your sauce and let it melt in. Enjoy! January Diets - No Chocolate Cake! Well just one..
... put the diet on hold this weekend and enjoy! How on earth can we be good in these cold days, I am cold and need some comfort food every now and again. It is hard work with a young baby all day, lifting and running about and then to live on a salad - no way! Yes, we are a healthy family and I am not saying go crazy but you deserve a little treat to both make and enjoy cake. A simple pleasure and an delight to make! 1. Cream together the butter and sugar until they are light and fluffy. 2. Beat in the eggs one by one. 3. Sift the flour, baking powder and cocoa into the mixture and fold. 4. Add the milk or tipple of choice and fold. 5. Grease two eight inches cake tins and add the mixture. 6. Bake in a 175C oven or equivalent for 30 mins or until a knife is clean on testing. 7. Leave to cool and then sandwich together with hot apricot jam. People spend more and more time on wrapping a special present and many times it just goes straight in the bin! Keep all those bits of wrap by stitching them together and making a 'paper' out of them to wrap around an album. 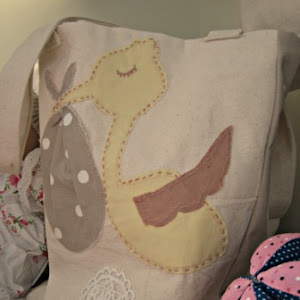 Keep those personal memories going with your own bespoke stitching! 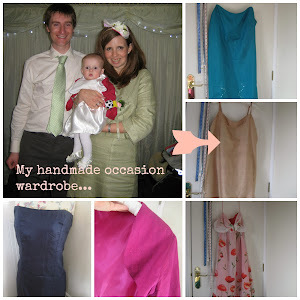 For me with a young baby, I needed to find an outfit for both Mummy and little one for a family wedding. I just love making something totally unique and with a yong baby it was the easiest option. Stores just are not set up to cater for the new Mummy shape for special occasions. I spent one afternoon looking for a new Mummy special occasion outfit and I simply could not find something that would be captured on film for future generations! All I could wear was maternity wear which was stretchy and jersery and not flattering. So I bought 3 metres of fabric and made this soft green 1960's style suit which fitted me like a glove. I loved that I made it and that the it fitted my new Mummy shape, nothing in the stores fitted me on the top and the bottom. So frustrating! Baby wore a dress that I designed her using a smock pattern as my block. The fabric was from the 1960's also given to me by my Mum. It was a satin in off white and baby lit up the room as the light bounced off her dress. 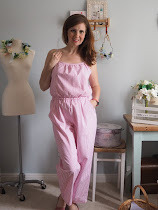 The project back in April 2012 gave me a sense of identity, that even though I was a new Mum I still had time to make our outfits that were personal to us and for future generations they have a story attached to them. How Beautiful A Handmade Gift For The Home....? If you know someone who loves a certain colour or style why not this weekend go to your local fabric shop and by 1 metre of fabric a cushion inner and some thread and make a homemade cushion. My cushion was for someone who loved vintage, roses and lace and I wanted it all in cotton, I found this beautiful fabric at www.cathkidston.co.uk/ store and only needed 1 metre for the project. I bought the cushion inner and sewing threads from a haberdashery and the cotton thread off the local market. The project took me less than two hours to make, I measured out the cushion inner and added 10 cm on for cushion bulk and seam allowances. Then instead of adding a zip I put a envelope opening in the back where the cushion inner can be posted in. This is made by cutting the back of the fabric in 2 pieces both 75% length then turning over twice to give a professional finish but making sure the lap over is approximately 10 cm. I added the lace trim to the edges and hand stitched the corners under to reduce fraying. You can pipe the cushion but with lace at the edges this would be too much. I just love this cake as it has all those lovely things that you need after a busy day. So rich but light and easy to pop in the oven if you have the oven on for dinner. 4. Add the Baileys cream and fold. Leave to cool and either serve as it is or with fresh cream. Lovely change to spiced and fruity cake at this time of year. 4. Then take a tablespoon of the mixture and mould in your hands like a snow ball. 5. Place the ball in a food bag and mould really tight into a ball through the plastic. 6. Wrap tightly in the foil and leave for 24 hours. 7. After 24 hours roll in the a mixture of earl grey tea leaves and 1 tablespoon of cornflower. Once dry wrap in brown paper or acetate and they are ready to use! I really hope you enjoy making these bombes as much as I did. Please send me your ideas and I try and make a new recipe. Let's Put A Lid On The Spending For A Month..
For the month of January, let's close our purses, clear out our cupboards and be a bit thrifty. No more sales shopping, no bargains and everything must go sales. Let's take this month to re-evaluate what we have, what we use in our daily lives and what we don't need we can look at what to do with it? I am guilty of buying things on impulse, most women shop on emotion so it's not surprising that we do! I had a clear out of my draw of tights and I was surprise to find how many colours of the same ones I had. I must have thought, hey red ones, so cool - I'll get a pair. But I thought it at least three times and it's face it you don't wear red tights every day. So have a clear our, label up or sort what you do need in a clear accessible way. With a baby, I find that what is last in the draw is first out so I tend to wear the same thing again and again! Rotate your wardrobe regularly. I also think that being ruthless sometimes is great, go through your wardrobe and anything you have not worn for 12 month (or 2 year if you have been pregnant) get rid of! Out is goes! When you have a pile of items that you know don't fit or won't be worn as they are again put in one big pile. Now this is the fun bit, if you sew or customise you can look through your pile for something to cut, amend or embellish. I did this exercise this evening and I have a black dress which I am going to re-cut as I still love the fabric. Any old denimn I save, recut and paint with fabric paints. 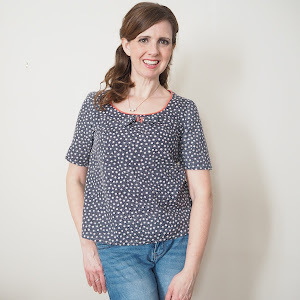 I have a few projects on the blog under sewing. Really individual and a joy to create! My wardrobe is just the start, I know that the free space now means I can see what I have and wear it more frequently. Why did I need all that stuff anyway. Plus I can bring new life into something old and tired out..what creative mind would not like that! After a wonderful 2012, and now with a 14 month old baby, we are now looking to the future as a little family. For me, being a new Mummy has be rewarding and challenging. I wanted to keep all my old identity, old hobbies and interests and old job and be a fabulous Mummy, Wife and Daughter. What I found was impossible reality, something had to go and with the demand of overseas travel and long working hours, last Summer I had to quit my job. After working since I was 15 (that's 22 years!) I now find myself in a tough labour market, over qualified and wanting to still keep my creative integrity. My only option at the moment to fit around family life is to be my own boss and challenge my own creative flair. Now baby is sleeping for longer in the evenings and now Mr CIM is working normal hours, I am going to be working on projects and commissions to immerse myself in what I really love. My first project is a wedding sampler for a 2013 wedding, I love the vintage linen fabric and the golden ribbons and over dyed vintage lace.